Sony Music's dance music imprint Deconstruction Records is launching a clothing range. The first items in the new range are high quality 100% cotton t-shirts featuring iconic slogans and graphics. Retailing at �40 the t-shirts will be stocked in Harvey Nichol's London store, Harrods and Urban Outfitters. "Club culture is a way of life and Deconstruction - past and present - has played a central role within it. 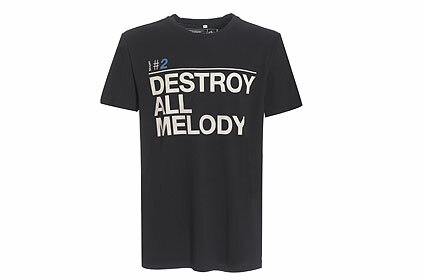 The slogans and artwork have always been a defining character of what makes Deconstruction stand out from the other music labels and this is now carried through to the clothing line" says Bobby Langley, Sony Music's Head of Merchandise. Deconstruction Records was founded in 1987 and ran until 2001. Artists featured on the label included Black Box, M People, Way Out West, Sasha, N Joi and Kylie Minogue. It was reborn in 2009 under the direction of Mike Pickering, the A&R responsible for The Ting Tings, Kasabian, Will Young, The Gossip and Calvin Harris. Beth Ditto, Retro/Grade, Kenneth Bager, Jack Beats, Burns, Murray James and Axwell are all current Deconstruction artists.